Eruptive Prominence - This looping eruptive prominence blasted out from a powerful active region on July 29, 2005. Active regions are areas of strong magnetic forces. 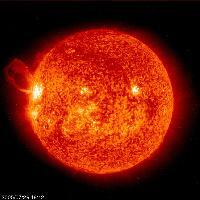 Within an hour the prominence had broken away from the Sun. Emission in this spectral line of EIT 304? shows the upper chromosphere at a temperature of about 60,000 degrees K. The areas of greatest intensity appear almost white, while the darker red areas indicate less intensity.